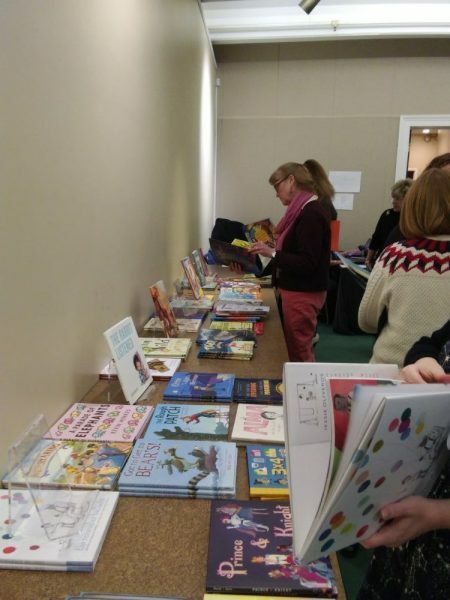 On Saturday, January 26, 2019 the Bexley Public Library hosted the annual Caldecott Read-In and welcomed educators and school librarians from Bexley City Schools and beyond to review the best in children’s, juvenile, and young adult fiction from the past year. Educators then use this information to make lesson plans for their classrooms. Attendees also voted on their favorites ahead of the annual Caldecott and Newbery award announcements, which will be made on January 28 at the American Library Association mid-winter conference. Support for the Caldecott Read-In is provided by the Barbara and David Brandt Family “Read for Life” Endowment Fund at the Bexley Education Foundation. The fund also supports the freshman book gift program at Bexley High School. The program, now in its third year, provides a free book to every “rising” BHS freshman to read over the summer months. Students get to select from a variety of works of fiction, non-fiction, biographies as well as graphic novels from a list compiled by BHS English teachers. The Brandt Family “Read for Life” Endowment was established in 2014 by David and Barbara Brandt, BHS graduates, Class ’59. < Children’s Art at the Heart of BRAVO!